NVIDIA launched the SHIELD Tablet way back in the summer of 2014. Most device makers would have long since abandoned a tablet from that era, but NVIDIA has kept it reasonably up-to-date. The tablet is running Nougat and got the KRACK patch late last year. Now, NVIDIA says it's working on a new patch to address the recent spate of CPU vulnerabilities. The Spectre and Meltdown CPU flaws were detailed earlier this month. While Meltdown is limited to x86 architectures, Spectre can affect ARM. NVIDIA says its GPUs are not affected, but the Cortex-A15 CPU cores in the Tegra chip are potentially vulnerable to Spectre (variant 1 and 2). Software mitigation can protect the SHIELD tablet, so an update is in the works to keep users safe. NVIDIA says the Spectre patch should be ready later this month. It will be part of the SHIELD Experience Upgrade 5.4. Both the SHIELD Tablet and the Tablet K1 are on v5.3, so this should apply to both devices. We don't know if there will be anything else included in the update, but it's nice to see NVIDIA still keeping an older tablet secure. 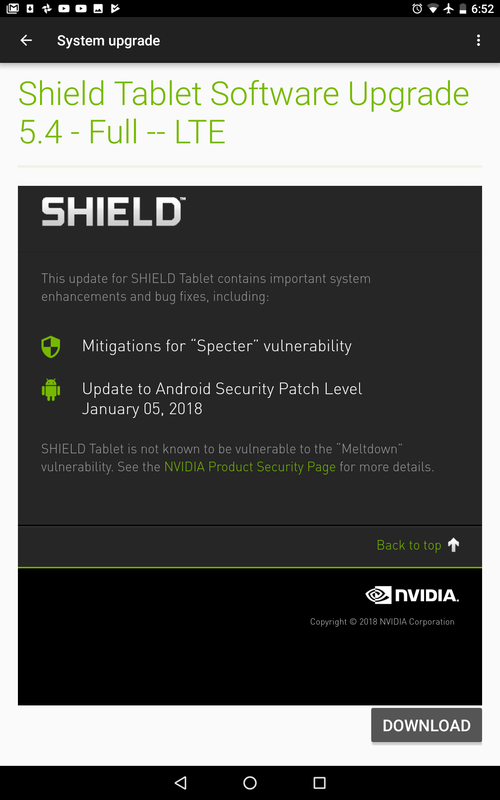 It took a bit longer than expected, but the Experience Upgrade 5.4 is now rolling out to the Tablet and Tablet K1 with the Spectre patch and the January 2018 security level. Thanks Soren and Zach Webb.